Paddling along our Space Coast is one of the best Florida Kayaking experiences you can get as the Indian River Lagoon System boasts the highest biodiversity of any estaurine ecosystem in the country. Kayak the Indian River Lagoon System and you can find yourself paddling over Grass Flats loaded with fish, wading birds and a look down into the seagrasses themself brings into view all kinds of marine life. Paddling among manatees and dolphins is a common occurance. There are many islands to explore, some of which serve as bird rookeries, while paddling or kayaking along many areas of mangrove shoreline offer a chance to see the Florida that Ponce DeLeon experienced upon his arrival. There are three primary water bodies within the Indian River Lagoon system within the Space Coast. 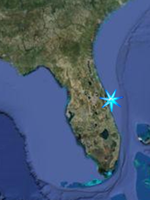 They include the Indian river Lagoon itself, the Banana River, and the Mosquito Lagoon. One of the premere kayaking areas within the Indian River Lagoon include the chance to kayak the Merritt Island National Wildlife Refuge. There is literally miles of paddling here and many places to launch from. Some of the more popular venues include Haulover Canal, Mullethead Island, Dummits Cove, Patillo Creek, Gator Creek, Catfish Creek, and Peacocks Pocket. The North End of the Indian River Lagoon is anchored by Turnbul Creek, an absolutely great paddle from US-1 in South volusia County and paddling northwest takes you to a freshwater habitat while paddling southwest from the put in takes you through a saltmarsh and into the northernmost point on the Indian River Lagoon. Canaveral National Seashore, located in North Brevard just west of Titusville and South Volusia County just south of New Smyrna Beach is another premere paddling destination and offer several places to kayak, paddle or canoe the Mosquito Lagoon. In the North District the Shipyard Island Canoe Trail offer chances for Island Camping as well while the south portion of the Mosquito Lagoon can be reached from Eddy Creek and several put in spots from Biolab Road. The paddling here is spectacular and was named by Outdoor Magazine as one of the top paddling destinations. 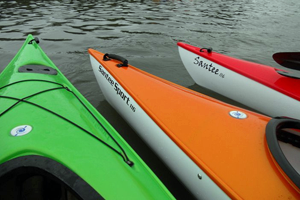 Freshwater paddling destinations in the Northern Space Coast Area offer the opportunity to kayak the St. Johns River in the vicinity of Puzzle lake, Salt lake, Loughman Lake, and a great paddle is the Econlockhatchee River, flowing from the west near Orlando and into the St. Johns River. Meanwhile, Fox Lake Park in Titusville is a hidden gem among kayaking destinations. The Central part of the Space Coast, while more developed offers some great kayaking as well, anchored by the opportunity to kayak the Thousand Islands Area of Cocoa Beach paddling through mangrove tunnels between the islands. Kayaking at Port Canaveral puts you in one of the busiest seaports of the world yet still offers the chance to see manatees dolphins and birdlife such a gannets gulls, shorebirds, and wading birds along the rocks and docks while looking down among the rocks may reward yoou with the sighting of a seaturtle grazing on algae. Ulumay Sanctuary offers the chance to get lost paddling through a salt marsh. Samsons Island in Satellite Beach offers camping and kayak trails while the Eau Gallie River im Melbourne offers another kayaking hidden gem. Freshwater Destinations here include three access points to kayak the St Johns River within the River lakes Conservation Area. The Southern Portion of the Space Coast is anchored in saltwater by Sebastian Inlet State Park, one of Florida's premier state parks and offers camping , fishing, hiking, snorkeling, and beachgoing in addition to the great kayaking along Mangrove Shorelines. The Mangrove Islands and Channels of Mullet Creek, accessed from Honest Johns Fish Camp is one of the best in the entire state. Pelican Island National Wildlife Refuge just to the south offers the chance to kayak America's oldest wildlife refuge, established in 1904 to protect egrets and herons from commercial hunters shooting them for the feathers that were popular in women's hats at the time. From the mainland you can kayak the many spoil islands of the Indian River lagoon, many of which offer primitive camping opportunities while others are reserved for bird rookeries, making for a spactacular Indian River kayaking experience. In freshwater, you can access Three Forks Conservation Area and kayak the headwaters of the St Johns River, while Lake Blue Cypress Conservation Area offers unparalelled birding and bass fishing by kayak.